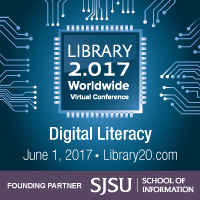 The Library 2.017 online mini-conference on Digital Literacy + Fake News mini-conference was held earlier today. If you weren’t able to attend in real-time, all the webinar recordings are now available. A list of the session topics and presenters appears below. Choose from an easy to watch video recording, an audio recording or a full version of the Blackboard webinar room – complete with a recording of the live chat.Â Links to sessions on the conference archives page. Mark Ray Information Literacy? Future Ready Librarians Can Do That!